LAS VEGAS — XpressWest, the private U.S. firm proposing to build a high-speed rail link between Las Vegas and Los Angeles, terminated a joint venture with Chinese companies less than nine months after the deal was announced, citing delays faced by its partner, Business Insider reported. Las Vegas-based XpressWest said the decision to end the relationship stemmed from problems with "timely performance" and challenges that the Chinese companies, grouped under a consortium called China Railway International (CRI), faced "obtaining required authority to proceed with required development activities," the report said. The announcement is a blow to China, which has built the world's largest high-speed rail network in less than a decade. The XpressWest project was seen as a foothold into a burgeoning U.S. high-speed rail market and an opportunity to showcase China's technology, according to Business Insider. For the full story, click here. 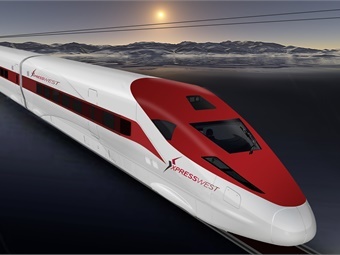 XpressWest has terminated its joint venture activities with CRI regarding high-speed passenger rail. In September 2015, XpressWest and CRI commenced joint venture activities intended to advance the substantial work already completed by XpressWest. After an exhaustive process, XpressWest selected CRI to assist develop, finance, build and potentially operate the XpressWest rail project connecting Las Vegas, Nevada to Los Angeles, California (the “Southwest Rail Network”), with stations in Las Vegas, Nevada, Victorville, California, and Palmdale, California, and service throughout Los Angeles. The decision to terminate the relationship was based primarily upon difficulties associated with timely performance and CRI’s challenges in obtaining required authority to proceed with required development activities. “The team at XpressWest is optimistic CRI and its affiliates will one-day succeed in establishing a viable presence in the United States rail market, however, our ambitions outpace CRI’s ability to move the project forward timely and efficiently. XpressWest is undeterred by this development and remains dedicated to completing its high-speed passenger rail project. XpressWest will now aggressively pursue other available development partnerships and options expected to result in a more efficient and cost-effective project implementation experience,” said Tony Marnell, CEO of XpressWest. XpressWest is eagerly anticipating the completion of the final environmental work required for the development of the line connecting the project to Los Angeles through Victorville and Palmdale, California. The environmental approvals for the Victorville-Palmdale segment are expected no later than September 2016. Additionally, XpressWest, the High Desert Corridor Joint Power Authority, California High Speed Rail Authority, San Bernardino County and Los Angeles County Metropolitan Transportation Authority are also expecting the completion of the jointly-funded Southwest Rail Network ridership study no later than August 2016. The ridership study is a prerequisite for a variety of regulatory and financing activities. XpressWest is dedicated to completing all necessary activities to complete its high-speed passenger rail project.